Memorial Day Weekend, I did a few things I'd never done before. 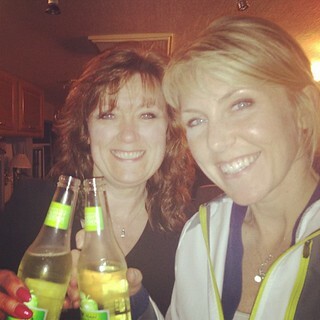 I cheersed with my Mom. The other thing I'd never done before was drink a light cider. You can find more information on the MichelobULTRA Light Cider page on BlogHer.com, but thanks to Michelob offering a review program, I was able to try out their new Michelob ULTRA Light Cider. I was instantly intrigued when I heard that it was naturally sweetened and gluten-free, having been made from crisp apples. Given that I don't drink a ton of sweet beverages, hearing that it boasted a more mellow sweetness than traditional ciders perked my interest as well. Even though I'm usually only good for one or two adult beverages, I did not want to battle any gut rot from imbibing in a too sweet drink. For specific product details, there's more information on the Sponsor's site. Let's be honest though, the fact that it has fewer calories than traditional ciders is what really won me over. I felt like a Michelob spokesperson, telling my family the supplied quote "“As more people continue to discover cider, we've found that many view traditional ciders as either too heavy, too sweet or both,""said Ryan Moore, vice president of premium lights, Anheuser-Busch. ""This perception has often times limited ciders to a seasonal beverage during fall and winter, but we saw an untapped potential to expand the category as a year-round option. Michelob ULTRA Light Cider fills this void with a lower calorie cider with a milder, but distinct, sweetness that can be enjoyed straight or over ice."" Michelob ULTRA Light Cider is crisp, light and refreshing. It offers a less sweet, lower calorie alternative to traditional ciders and it naturally sweetened. From a non-cider drinkers perspective, it was very light and delicious, but and I hate to say this, almost too light. I kept finding myself comparing it to an apple wine. I would definitely think that for someone who doesn't drink traditional ciders, Michelob ULTRA Light Cider would be a great option to change it up from a wine cooler or mixed drink. It was certainly enjoyed while we bunkered down in the RV during a downpour. this is reason #434 why this baby needs to get out so i can have one! I heard about them teh other day and i want one!! !